My nephew reminds me so much of myself it's scary. If you didn't know he was my nephew you would think he was my son. 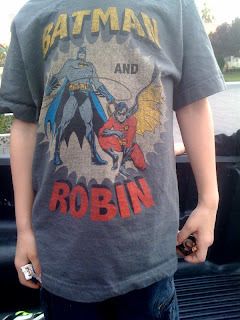 This past weekend we went to a family barbecue and I immediately spotted him wearing this this Batman t-shirt. I thought it was pretty cool looking. Batman was in his classic costume, but Robin's was a little different. I think I have seen Robin in this costume before (just don't where). You can see here Robin is in a full body suit and has a cape scalloped similar to Batman's. I need to pick one of these up for myself. I think it looks cool. P.S. you can see Indiana Jones in my nephews left hand. Damn this kid is cool.